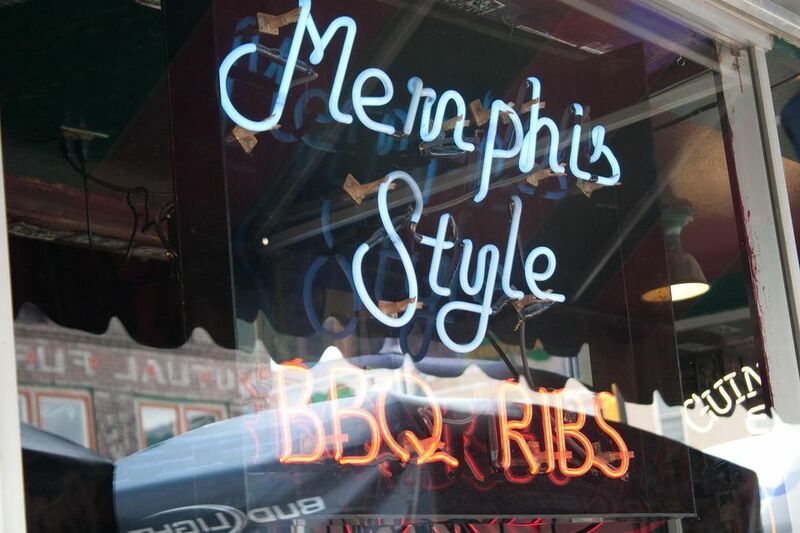 One of the many reasons for the popularity of Memphis style barbecue is its unique blend of the greatest barbecue traditions. Here you will find seasonings that are neither too sweet, nor too hot. Sauces, when used, can contain tomato, vinegar or mustard. Traditionally, Memphis Style ribs are smoked "dry", meaning that only a dry rub is applied. If a sauce is present, it is served on the side and added (or not) by the lucky person with a full plate of ribs in front of them. Memphis dry ribs are smoked similarly to other barbecue pork ribs. However, in Memphis, the quality of the ribs and the flavor of the meat are much more important than any sauce or seasoning. This is an old tradition that dates back to the early days of barbecue when a barbecue shack really was a shack. As times changed, the tradition continued, giving us just about the best ribs in the world. Memphis ribs are typically spareribs cut St. Louis style. This means that you take the full sparerib rack and trim it to nice, neat ribs. Start by laying the ribs out, bone side down and cutting along the line of fat at the base of the ribs. This will give you a good piece of cartilaginous rib tips. Now flip over the rack and cut off the flap of meat in the middle of the rack. Grill these two portions up for a tasty appetizer. Lastly, remove the membrane from the back of the ribs to let in the flavor and allow excess fat to melt away. Memphis tradition also suggests that you remove the long muscle from the front of the ribs. If you look at the rack, bone side down, you can see it. This really isn't necessary and to be honest, I'm not entirely sure why was done. This practice is somewhat obsolete today. Since these ribs are generally served without sauce, the rub is your best source of flavor aside from the meat itself. Memphis style rubs are generally mild in flavor and should be applied generously. The rule with rubs is, what sticks is how much you need. Some places, however, will roll racks of ribs in dry rub and cake it thick on the meat. What happens here is that the moisture from the meat mixes with the rub forming a thick paste on the surface of the ribs. One trick to adding moisture to Memphis style ribs is to apply a mop. A mop is a thin sauce that is "mopped" on meats as they cook. A great way to make up the perfect mop for Memphis ribs is to take your dry rub and add water and maybe a little ketchup (if you so choose). Make the mop thin and runny and apply it to the ribs every 30 minutes to an hour while they smoke. Smoke these wonderful ribs as normal but be careful not to knock too much of the rub from the ribs. Memphis style pork ribs give you and your guests the best of both worlds. Properly smoked these "dry" ribs won't be dry and those who like sauce can add it at the table. Those who prefer the meaty flavor of these ribs can just dig in.